1. 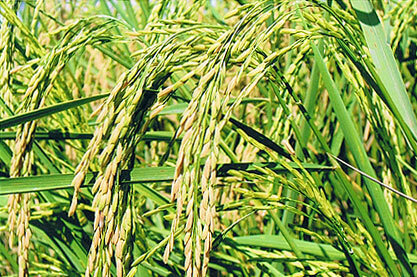 RICE ( ‘ Kao’ ) : there are two main varieties of rice that Thai people like to eat. ‘ Kao Nio’ or sticky rice and ‘ Kao Jaw’ or plain rice. The way of cooking is completely different. ‘ Kao Nio’ we have to soak overnight in the water and steam it. ‘ Kao Jaw’, which can be brown, red, white, Jasmine or Basmati rice, we boil in the water. 2. 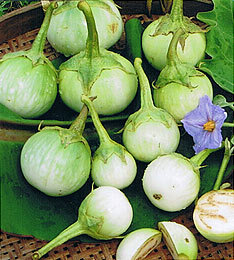 BITTER EGGPLANT ( ‘ Makheau Phuang ‘): we use as a vegetable, mostly in curries. The taste is more bitter than other varieties of eggplants. 3. 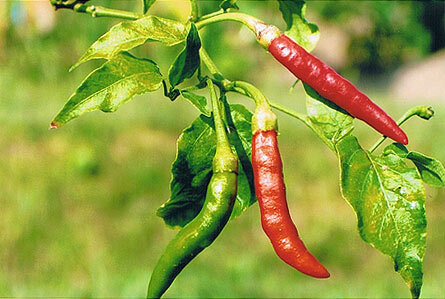 HOT CHILLI ( ‘ Prik Kie Noo’ ): this is the smallest variety of chilli, but also the most spicy one. 4. 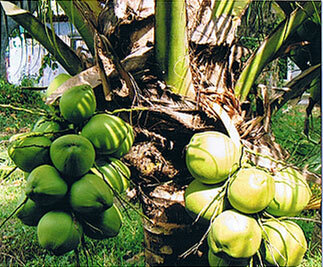 COCONUT ( ‘ Ma Prao ‘ ): Young green coconuts are used for its juice. The flesh is soft and jelly. After a few months the coconut turns to brown. We do not drink its juice anymore but grate the hard flesh to make coconut milk. 6. 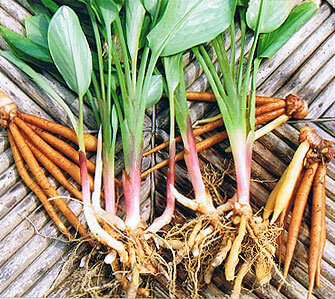 GALANGAL ( ‘ Khaa ‘ ): also known as Siamese ginger. 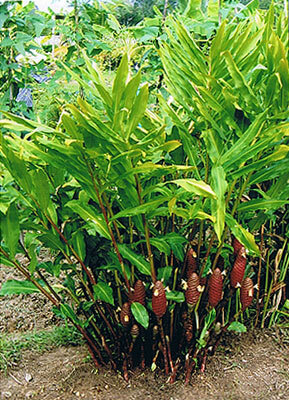 The roots are longer than those of common ginger. Often used in curry pastes, Tom Yam and the famous coconut milk soup or Tom Khaa. 7. 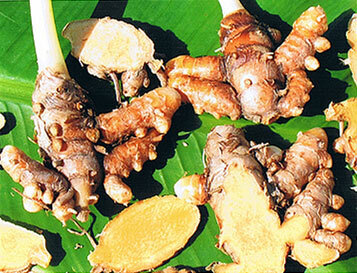 THAI GINSENG ( ‘ Kra Chaai ‘ ):yellow-brown roots used in the curry pastes and fish dishes. 8. 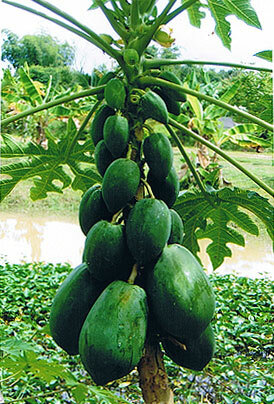 PAPAYA ( ‘ Ma Lagor ‘ ): a long or round green fruit. Young green ones we use for salad. The ripe orange papaya we eat as a fruit. The taste is sweet. 9. LEMONGRASS ( ‘ Ta Krai ‘ ): a grey-green grass. Used in all curries and Tom Yam soups. The tea is good for digestion. 10. 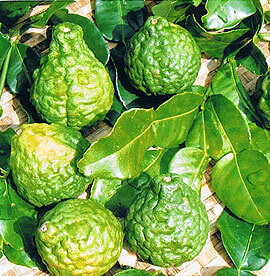 KAFFIR LIME ( ‘ Ma Krut ‘ ): looks like a lemon but has a rough skin. The flesh is bitter and almost contains no juice. Its rind and leaves are often used in curries or soups. 11. 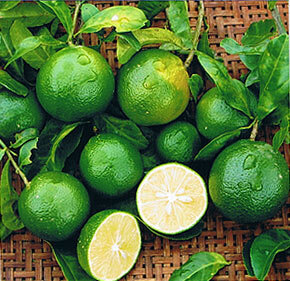 LEMON ( ‘ Ma Nao ‘ ): a round fruit with a thin green skin. 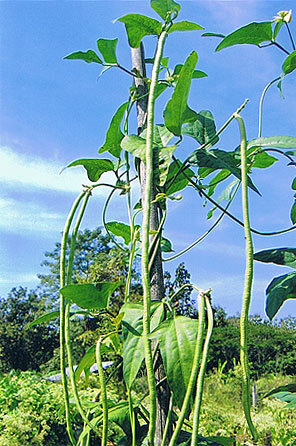 Used in Thai hot-sour dishes like salad or in a refreshing drink. 12. SWEET EGGPLANT ( ‘ Makheau Pro ‘ ): There are many varieties of eggplants. The ones Thai people like are the round green ones. Its taste is more sweet and often used in curries. Other varieties are the small long purple eggplants and those that we find in Europe and North- America which are bigger. 13. 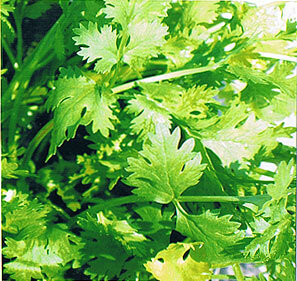 THAI PARSLEY ( ‘ Pak Chee Farang ‘ ): used for Tom Yam and salads. Has a strong smell. 14. 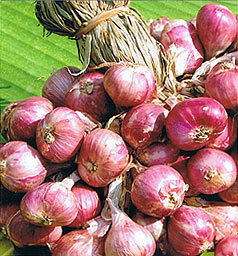 SHALLOT ( ‘ Hom Daeng ‘ ): small purple onions with a sweet pink flesh. Shallots have less juice and are therefore preferred for pounding to make paste. They have a special strong flavour. 15. 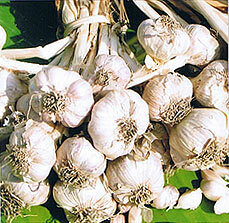 GARLIC ( ‘ Kra Thiam ‘ ): garlic is considered as an important ingredient in Thai cooking. 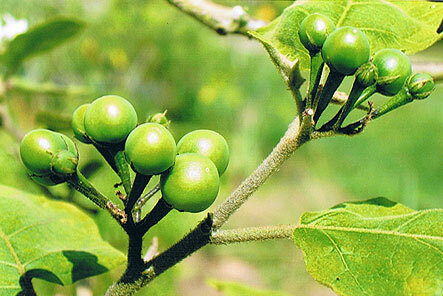 Also used as a medicine to reduce intestinal disorders. 16. 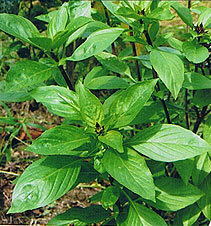 SWEET BASIL ( ‘ Horapaa ‘ ): deep green leaves used in green and red curry and similar to basil used in Italian food. 17. 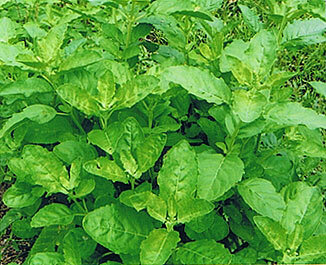 HOLY BASIL ( ‘ Ka Prao ‘ ): we use the green leaves for stir fried dishes. It has a hot flavour. 18. 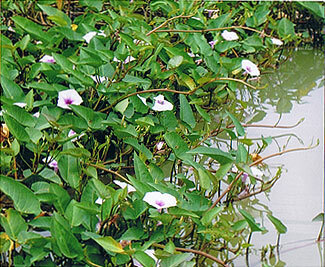 MORNING GLORY ( ‘ Pak Bung ‘ ): also known as water convulvus. Has green leaves and full of vitamin A and iron. Often fried with garlic and oyster sauce. 19. CORIANDER ( ‘ Pak Chee ‘ ): the seeds are roasted and used in curry pastes. 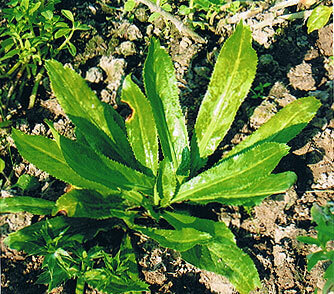 The leaves and stems are used for flavouring salads and soups. 20. TURMERIC ( ‘ Kha Min ‘ ): a small ginger with a bright orange colour, mostly used to colour yellow curries. 21. LONG GREEN FRESH CHILLI ( ‘ Prik Kieuw Sod ‘ ): less hot than the small chillies. We use them in green curry paste, to make green colour. 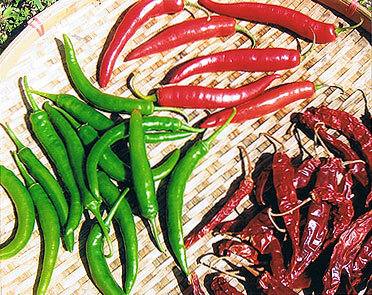 When ripe, the colour turns red, we pick them and dry them, we use them to make red curry paste. 22. 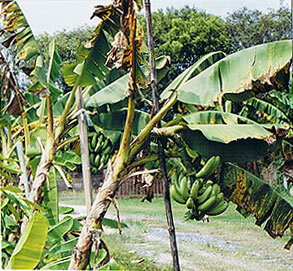 BANANA ( ‘ Kluai ‘ ): not only the banana is eaten but also the flower is used in curries and the banana leaves are used to wrap food and to garnish plates. When the banana gets more ripe, it will become even more sweet and is used in desserts like fried bananas and bananas in coconut milk. 23. 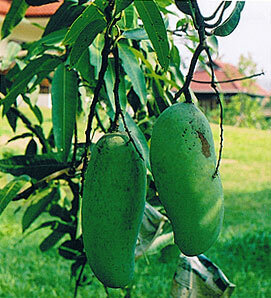 MANGO ( ‘ Ma Muang ‘ ): there are different varieties. Unripe mangoes are green and its flesh is white. They are sour and crispy. Ripe mangoes are yellow and have a sweet taste. They are used for the favorite dish Mango with sticky rice. 24. 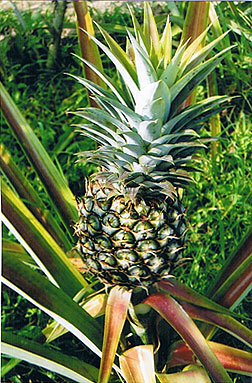 PINEAPPLE ( ‘ Saparot ‘ ): grows in the middle of a low plant. Eaten as a fruit with a sweet and sour taste. 25. 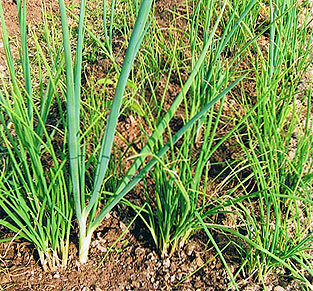 SPRING ONION ( ‘ Ton Horm ‘ ): in Thai cooking they are added to soups, stir fried dishes or eaten raw. They grow in bunches and have a green colour, the bottom is white. 26. 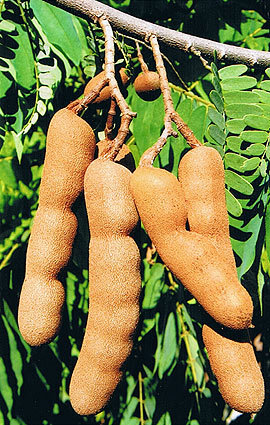 TAMARIND ( ‘ Ma Kaam ‘ ): we use the ripe tamarind to make juice to give sour flavour to a dish like Pad Thai. The tea is good for digestion. 27. 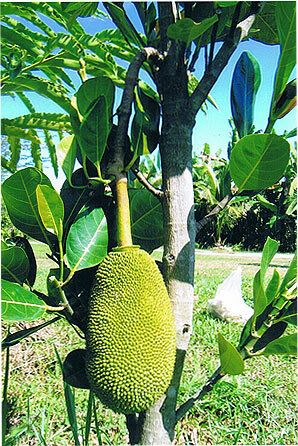 JACKFRUIT ( ‘ Ka Noon ‘ ): biggest fruit in the world, can weigh up until 50 kg. Ripe it is eaten as a fruit. Unripe it is used in Thai local curry or as a salad.